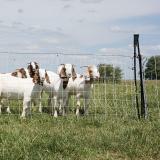 Step in and out of sheep or goat paddocks with ease when using a 35" tall ElectroNet® Gate. This complete gate system can be added to the ends of existing nets and electrified. The gate post locks in place via a handle and docking station. Stainless steel clips at each end of the gate provide electrical connections to netting. For a taller gate, look to 48" ElectroFence gates. Same mesh spacings as ElectroNet® but with tighter verticals, 6" instead of 12". Features drivable posts which are useful in dry, hard or rocky soils. Available as a 7.5 ft walk-through or a 21.5 ft for vehicles and whole flocks. For entering/exiting sheep and goat paddocks without having to turn off the fence energizer. Easily adjust the gate angle to create a temporary chute that can be used to guide the flock or herd in (or out) of a field. Includes gate, posts, handle and docking station. 7.5 ft and 21.5 ft length options. 9 horizontal strands (8 conductive). Horizontals are white/black or green/black. Visible for humans and animals against all backgrounds. Black/white gates have black posts and green/black gates have white posts. Horizontal spacings from bottom to top are: 4", 4", 4", 4", 4", 4", 6", 6". 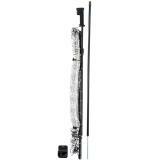 Verticals are white plastic struts spaced every 6". 0.75" dia drivable posts are PVC with an 8" metal ground spike. 21.5 ft gate contains a center post. The same “unroll and then unfold” process applies to all electrified nets. Minimal strength or skill needed (and no tools). If the gate is to be used in the middle of a fence line and power needs to be carried across, use a PowerLink to carry the power over to the continuing section of fence. Electric fence is a pain barrier, not a physical barrier. A common mistake is not electrifying it. Animals may escape or become entangled (and may die). On a % basis, entanglement is very rare, but it can and does occur. If animals are scared or starved it will not keep them in. Dry conditions and wintertime usage may reduce the effectiveness of electric netting. We do not recommend the use of electric netting during harsh winter conditions—ice and heavy snow can flatten netting and thereby damage it. Dry or frozen ground may cause post spikes to bend or break if inserted with force. Pilot holes may be needed. Solar powered 0.30 joule energizer. 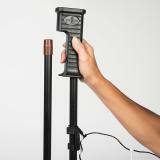 IntelliShock electric fence chargers are able to reduce battery draw when the fence's voltage is high. Portable 1.2 joule solar powered electric fence energizer. Lowest price for an all-in-one solar unit of this output. Easy access in/out of electric net fence enclosures without having to turn off the energizer. Perfect for sheep or goat paddocks. 35" tall installed. Recommended: 1 out of 2 said they would recommend this product to a friend. These net gates used to be AMAZING. As in, the best thing since sliced bread. They were economical, efficient, useful, simple, beautiful. Then, in a rare move, Premier decided to improve upon the perfect and make them expensive, cumbersome and not useful. They work as designed but the added features have made them no longer useful for how we used them, which was to keep our many, many gate openings closed economically without even needing to electrify them. Now, they *must* be electrified or the animals can flip the black handle with their noses and get themselves out. And you have to keep track of all the plastic parts in order for them to work right. We'd buy a pallet of them if they went back to their old design. Hugh O from Don't buy one. Buy MANY! The gates from Premier are great especially the shorter ones. It makes moving animals to rotating paddocks a piece of cake with just a bowl of grain to trick them in. The longer gates protect hay stacks from our moose and elk. Ok we let them have some, especially in hard winters with tons of snow like last winter. If I had unlimited money I would make all the paddocks out of 21 foot gates!